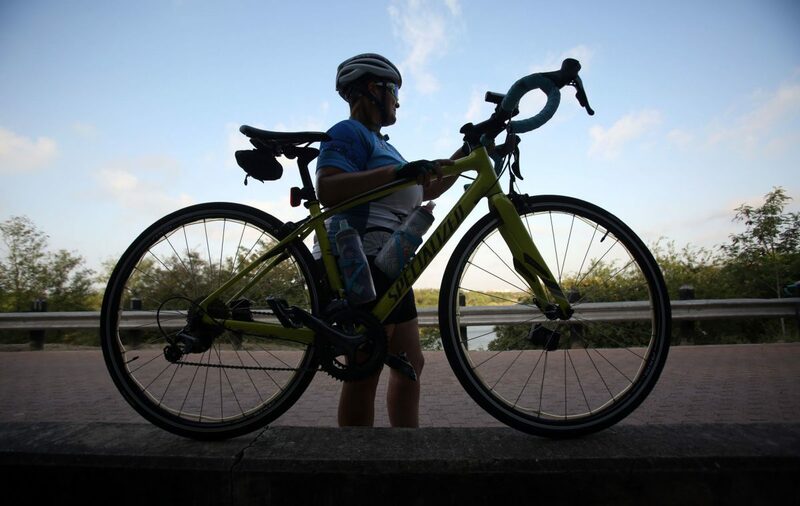 With the Rio Grande in the background, Diana Vera of Brownsville prepares to ride in the Ride For Hope on Sunday, June 10, 2018 at the Hidalgo Pumphouse. McALLEN — ‘Suenos Americanos’, Todos Somos Inmigrantes (American dreams; we’re all immigrants) was a phrase coined for Sunday’s second annual Ride for Hope to describe the immigrants making their way to the United States. Catholic Charities of the Rio Grande Valley, with the assistance of Sacred Heart Catholic Church, opened their doors as a Humanitarian Respite Center in 2014 and executive director, Sister Norma Pimentel has been there since the beginning assisting families, especially mothers and their children. The Humanitarian Crisis Relief provides assistance to the poor and vulnerable population within the community. The center located within the perimeters of the church provides a place for the refugees by offering warm meals, a shower and a change of clothing including medicine and other supplies before they continue their journey. The bike ride began at Pumphouse Park in Hidalgo and finished at an empty parking lot behind Sacred Heart Church or what is soon to be the location where the new respite center will be built. 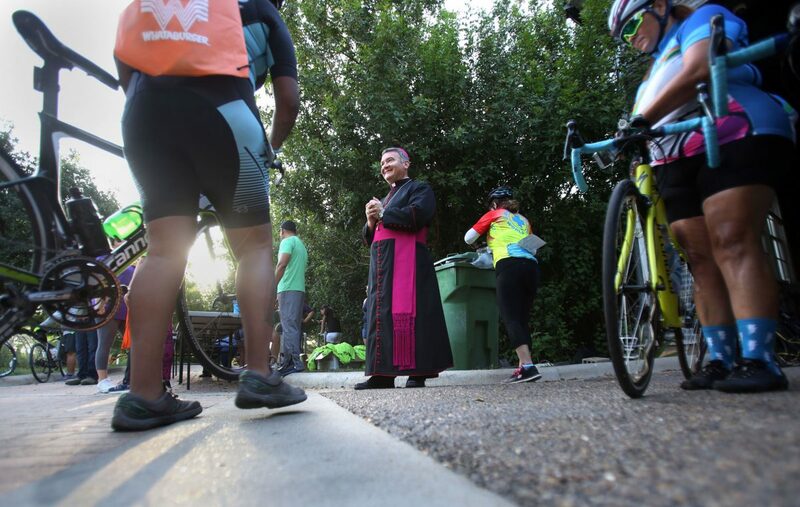 Auxiliary Bishop Mario Aviles of the Diocese of Brownsville greets the riders for the Ride For Hope 2018 on Sunday at the Hidalgo Pumphouse. 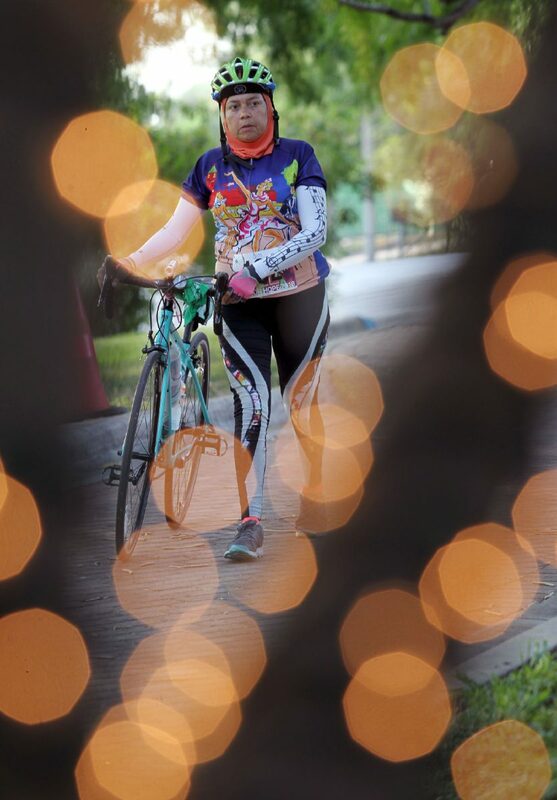 Vero Castillo of Brownsville makes her way to the starting line for the Ride for Hope 2018 on Sunday, June 10, 2018 at the Hidalgo Pumphouse. Pimentel said the mission of the Ride for Hope is to bring awareness of the struggling families and their journeys of coming to the United States. Many are because fleeing violence in their own country and want to be protected. “These people are not criminals and the majority of them are simple families; children and mothers who are victims of corruption and abuse,” Pimentel said. “As a community we must treat them with dignity and respect and be aware that they’re suffering and they must be given an opportunity to share their story and have reasons to be in this country. “We just see the overflow and we don’t see everybody,” she said. The majority of families are kept in detention centers waiting to be processed. Some bare allowed to continue the trek north to be with their families who are living elsewhere in the United States and to seek asylum. Due to the overbearing population of families, a new Respite Center has been in discussion for a couple of years. Pimentel hopes to have enough funds by the end of the year to begin building by early 2019. The new Humanitarian Respite Center will be located just one-block west of Sacred Heart Church at the intersection of Chicago Avenue and 16th Street in downtown McAllen. In addition to the approximately 20-mile bicycle ride across the two cities, there was also a 5K run, which was held around the Pumphouse Park also in support of funding the new center.